Unless otherwise expressly authorized in writing, Products are supplied for research use only. materials made using Products for Commercial Purposes, intended as any activity by a party that may include, but is not limited to: use of the Products in manufacturing; use of the Products to provide a service; use of the Products for diagnostic purposes; resale of the Products, whether or not such Products are resold for use in research. GoDiagnostics srl will not assert a claim against the buyer of infringement of the above patents based upon the manufacture, use or sale of clinical diagnostic, vaccine or prophylactic products developed in research by the buyer in which Products were employed. 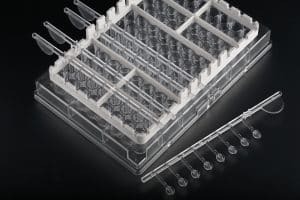 the multi-catcher device with 8 or 12 immunosorbent ogival pins, held in a special rack suitable for moving 8 or 12 multi-catcher devices, easily and simultaneously. Device pins are sensitized with different catchers and different tests are carried out in one shot. kits for single sample contain only 1 microplate pre-filled with washing solution, conjugate and chromogenic substrate in different columns. tested sample aliquot increases, easing the highly diluted target detection.